The success of seven Indigenous women in a horticulture training course has planted the seed for a bush tomato enterprise at a remote Territory community. The women, from the Canteen Creek community Owairtilla, 530 kilometres north of Alice Springs, have just graduated from an innovative training course, the Certificate I in horticulture through Charles Darwin University (CDU). During the course the students designed the women’s centre grounds, drawing on their knowledge of bush foods and information gained visiting the Tangentyere Nursery, Desert Park and the CSIRO Arid Zone Research Centre in Alice Springs. CDU horticulture lecturer Jade Kudrenko organised the visits to help the women understand the application of horticulture in different settings. ”It’s so important to show them the many resources and applications of horticulture so they can come back with ideas in their own communities,“ she said. Ms Kudrenko said the community was now in discussions with research brokerage organisation Desert Knowledge CRC to develop a bush tomato enterprise in the community. “The goal is to combine the women’s knowledge of horticulture and assistance of Desert Knowledge for the ultimate goal of employment which would be an excellent outcome,“ she said. 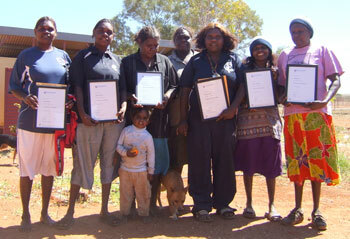 The success of the seven women in the horticulture course was recognised in a ceremony held in the community. ”More than 50 community people attended, reinforcing the achievements of these women and hopefully inspiring others,“ Ms Kudrenko said. The graduates received a mango tree to plant in their own garden. The mangoes and the barbecue supplies for the event were funded by Anyinginyi Health Aboriginal Corporation’s Grow Well Project.